Believe, Belong & Be Loved. At Eastwood Tulsa, we believe church is the perfect place for those three powerful things. We come together to be reminded of the incredible truths of God’s Word, which we believe wholeheartedly. In classes, ministries, outreaches, and small groups, we build close, transformative relationships that give us a strong sense of belonging to God and to the body of Christ. And in corporate worship, we experience God’s amazing presence, hear Him speak to our hearts, and are constantly reminded of how deeply, powerfully, and unconditionally loved we are. We're glad you're joining us today! Visit www.eastwoodtulsa.org to learn more about our church. If you missed any part of this series, you can find them on our website and YouTube Channel. As part of our #SharetheLove Campaign, we give you the new and improved Eastwood Tulsa App!Our free app is the hub of all things Eastwood Tulsa with a few extra benefits and surprises for our users. Download the New Eastwood Tulsa App 4.01. Text “EWTULSA APP” to 77977 or go to https://eastwoodtulsa.org/app.2. Click the hyperlink in the auto-replied text message to open the App Store.3. Download the new Eastwood Tulsa App. Thanks for downloading our free app and stay connected with Eastwood Tulsa Anytime – Anywhere! What if love was the ‘filter’ for everything you did? Every action, every thought that you entertained. The Bible says, “Let all you do be done in love” (1 Corinthians 16:14).That text came to my mind as I jumped up from working on this message and tried to do a project that involved another person. I believe God was speaking to me. I wanted to finish this message and the additional task was not being done by consciously loving the people around me. So does that mean at your job, too? School? Shopping? Yes! 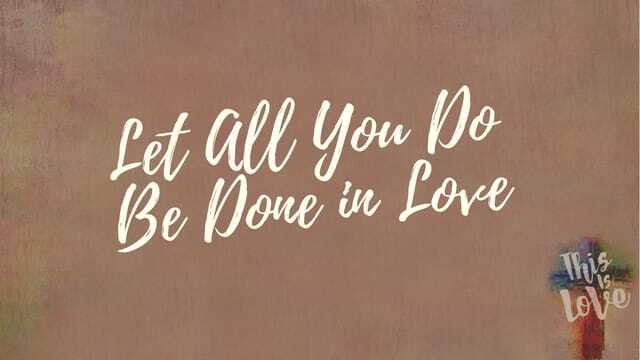 Let ALLyou do be done in LOVE. If God is living in believers, and He is, then His honor and glory are at stake as you shine as His light in the world. He said that we are the light of the world. In order to see what true love looks like, God has put His life and love in us so that others can see it. We can see His creative power in the universe or in a beautiful sunset. Others can see His transforming power through us when we love our enemies as well as our friends. His wisdom is seen in the complexity of the human eye; His love is seen when we are patient and kind to someone who has wronged or offended us. Let’s re-read the characteristics of love in 1 Corinthians 13 so we don’t think of love as merely a feeling or only an emotion. This chapter describes the active love that we should exhibit as a follower of Christ. Convicting right? Are you ever impatient with others? Irritable? Rude? Remember, let ALL you do be done in LOVE. The love that we just read about. At work, and in your home when you are tired from the day’s work. My mouth has gotten me into trouble more than once! If we don’t speak the truth in love (according to this verse) we stunt our spiritual growth. Have you ever said in anger, “O, grow up!”? Loving and caring for others through what we say and how we say it causes us to grow spiritually. Your words can build up or tear down, encourage others or discourage them. Our words can hurt or heal. They can be like knives or pleasant and like medicine. In all the political name calling and mudslinging, and posting on social media (and Christians are involved in this) there is not much love. As hateful, hurtful and wrong the abortion industry is we must love, not hate, those who are promoting and participating in that evil practice. If I am going to have gospel conversations with others, then my words must be spoken in love or I’m just making an annoying noise. You can be right in your theology but wrong in your method of sharing it. That doesn’t mean I’m not salty. Jesus said some of the hardest things, but they were always spoken in love. We should too. Our walk is our lifestyle. The way we conduct ourselves as believers. The way our light shines. Our lives should reflect the love of Christ. The following verses show us the holiness that should reflect our walk and our words. There is an ‘ought’ in our walk with Jesus. Look at Ephesians 5:3-7 and the verse below. Love, Jesus said, as I have loved you. The sacrificial, laying your life down, kind of love! That is possible only if He lives in you. That is possible as you die to yourself and let Him live through you. As you serve others. Faith and hope only work properly through love. Love is the greatest because it is what makes us who we are. God is love. He dwells in us. If we don’t love, we don’t really know God at all and all our effort is worthless. True hope never lets us down. The love of God is poured into our hearts because the Holy Spirit that God has given us. That God would: grant you, according to the riches of His glory, to be strengthened with might through His Spirit in the inner man, that Christ may dwell in your hearts through faith; that you, being rooted and grounded in love, may be able to comprehend with all the saints what is the width and length and depth and height—to know the love of Christ which passes knowledge; that you may be filled with all the fullness of God. Be sure to download the NEW Eastwood Tulsa app and check out the article in the link below for video tutorials and a walkthrough of the new Eastwood Tulsa App. Watch messages, get related articles, watch our podcast and more! Don't forget to save this event if you would like to have access to the sermon notes at a later time:).